← Beautiful, Abundant, Forgiving. . . Looking forward to trying the scalloped potatoes. Adorable photo! We missed you guys last week, but I know you were having a wonderful time. I love making scalloped potatoes, thanks for reminding me, and this is a much quicker way than I’ve done it before. I think I can pull that off this week, especially with it being kind of chilly. Very nice, once again. I love reading every one and reading the comments from others, especially Laura, so far away and yet so close. 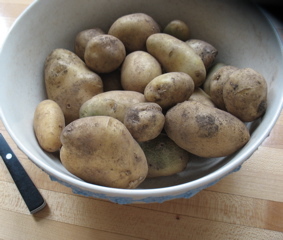 Now, I know what to do with the last of our Spring potatoes. But, tell us more about the soba noodles which sound like a perfect summer dish. I will write something about the sobas. I made it up on the spot and this was the gist of it: whole bunch of cilantro chopped, two cloves of new garlic minced, juice of 1 lime and half a lemon (because that’s what i had), about 2 tsps of minced ginger, a bunch of olive oil, salt, pepper, and a pinch or two of chili flakes. I threw a couple of handfuls of chopped snap peas in with the sobas right before they were done, then drained all, rinsed with cold water and added dressing. i think that was it! Would be good with other veggies/greens/scallions added, I’m sure too. 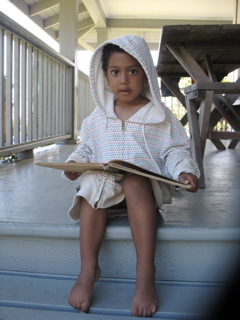 A joy to see Mish Mash bowls and pans and porch in your photos! Tom just dug some of his potatoes, so thanks for tonight’s menu. It took me a while, but I finally made the scalloped potatoes, mostly to placate my 15 year old who eats little but starch and cheese anyway. I didn’t have the pimenton, so cooked with what I had 🙂 and used regular paprika. So easy to assemble, and I even got to set the timer on the oven, leave for an appointment, and my daughter did the rest. When I returned home, she had eaten a substantial amount, and said “It’s awesome!” I tasted it and loved it too, especially the cumin and chile flavor. 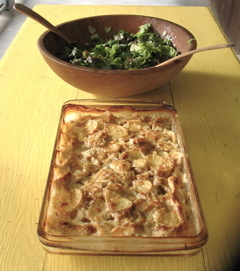 Much better than regular scalloped potatoes, and kid friendly too. Thanks, Katherine! a teenager–high praise. I’m in NYC for two days and have had some wonderful meals and am coming back with new inspiration.